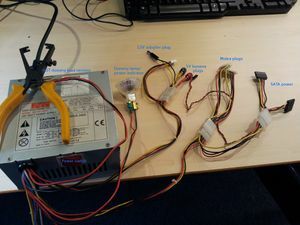 Made a very simple PSU for disks and tinkering. Changed the power switch to a built-in model to make it neater and safer. Please note there are no fuses, so do not short and/or rely on the self-protect of the PSU. The dummy resistor on top get very hot, mind possible burn hazard (materials and/or skin). This page was last edited on 20 October 2013, at 01:55.